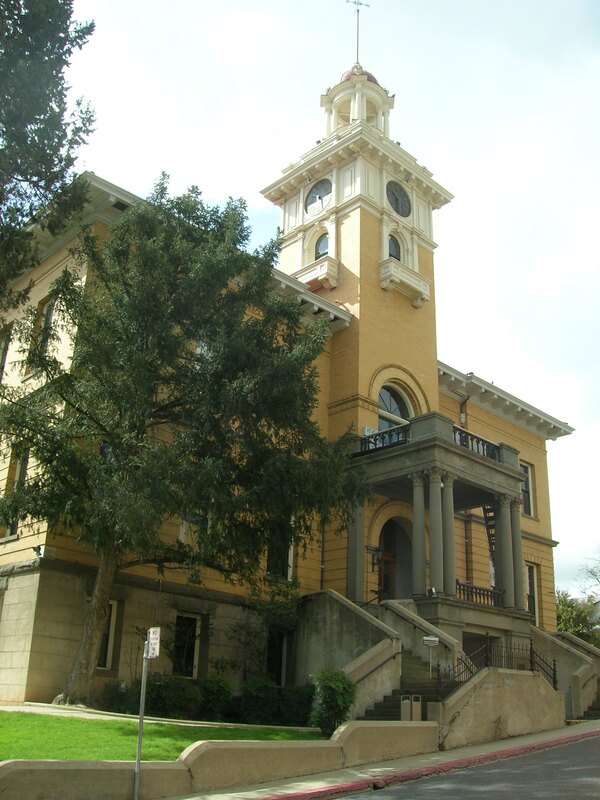 Historic Courthouse in Sonora, CA. Tuolumne County is located in the Central Sierra portion of California, approximately 130 miles Northeast of San Francisco. Tuolumne County was incorporated in 1850 as one of the original 27 counties in the State of California. The county covers approximately 2,229 square miles, stretching from the foothills to the crest of the Sierra Nevada Mountains. Originally dominated by mining and timber, it now enjoys a diversified economy, and has a population of over 54,000. Tuolumne County's first courthouse was erected in 1853 on the same lot occupied by the present courthouse. Sonora's downtown business owners wanted the building erected in that section, but uptown brothers and merchants Israel P. Yaney and John Yaney had other ideas. Together with William G. Heslep and Peter O. Bertine, they made five lots and a portion of two additional lots available to the county on such reasonable terms that the matter was settled. However, until then, a bitter battle ensued concerning where the location of the new courthouse should be built through print in the various newspapers in circulation at the time in Tuolumne County. The first courthouse remained occupied until 1898, when an economic boom occurred and it became evident that the old building was no longer adequate for the county's needs. The era of the "Second Gold Rush," which began in the early 1890's, brought with it not only the need for new county government facilities, but also the necessity to increase the tax base to finance the improvements. The exploitation of the rich gold bearing quartz ledges deep underground produced a ripple of prosperity that touched nearly every corner of Tuolumne County, including the construction of the Sierra Railway, the ability to harvest the timber resources, hydro-electric power development, improved means of transportation and communication, and the encouragement of investment by private capital. In keeping pace with this new era was the construction of a county hospital. On August 14, 1897, the Board of Supervisors adopted a resolution that the old courthouse was "…in a dilapidated and unsafe condition, its vaults in which the records of the county are kept are wholly inadequate for the necessities and demands of the county." The resolution further directed the Board's clerk to advertise for the submission of detailed plans and specifications for a brick and stone courthouse "to be erected at a cost not to exceed forty thousand dollars on the present courthouse site in the City of Sonora." After several days of examining plans and specifications submitted by ten architects, two deadlock ballots, and an extended session, on January 6, 1898, the Board of Supervisors selected the San Francisco firm of William Mooser & Son by a 3-2 vote. The building was originally designed to face east towards Washington Street, Sonora's main thoroughfare; however, it is local lore that one of the county's most affluent citizens and lumber magnate, Samuel S. Bradford, who resided across Yaney Avenue to the north, succeeded in having the plans altered so as to make the structure face his home, now the site of the A. N. Francisco Building. The Union Democrat, whose office was located adjacent to the Bradford home, was also quite favorable to having the new courthouse face Yaney Avenue. A Union Democrat article published on January 15, 1898, reported that, "The plan of the first floor is that the main entrance shall face to the north, with another place of ingress and egress on the south. All architects concur with Mr. Mooser that this is the true position for the main entrance, as it then comes to a street level and the surrounding view thereby afforded includes some of the handsomest buildings in town. . .". The final plans from William Mooser & Son were officially adopted on April 5, 1898, with the understanding that the courthouse would be a fireproof building, with fire hoses on each floor. On May 21, 1898, the courthouse construction contract was awarded to the low bidder, Charles F. McCarthy. The contract called for the old courthouse to be removed and the site ready for the contractor to begin work by July 20, 1898. The various county officers, their records, and furnishings were located throughout the downtown area. In mid-June, the old courthouse was auctioned off in three sections. Only about 50 people attended. The northern addition erected in 1891 was sold for $26.00, and the older addition on the south went for only $5.00. The original courthouse had been purchased by the contractor for $50.00. The total cost of the new courthouse, including electrical work, painting, heating, ventilating, vaults, and new matching furnishings came to $100,843.00. While this sum was over budget, it is significantly less than the cost for such a structure today. The cornerstone of the courthouse was dedicated on September 28, 1898, with approximately 500 spectators present in the midst of a drenching rainstorm. The formal dedication ceremonies were conducted by the Tuolumne Lodge No. 8, F. & A. M., and orator of the day, attorney Frank D. Nicol. During the following year, a three-story building was erected of steel, concrete, and brick. The hallways were laid with imported tile, the interior walls faced with fine local Columbia marble, and the open staircases guarded with ornate iron railings. The exterior was finished off with yellow Roman pressed brick and sandstone from Colusa County. On July 23, 1900, the contractor and Board of Supervisors declared the courthouse to be fully and finally completed and the work accepted. On January 1, 1981, the courthouse was listed on the National Register of Historic Places. Accordingly, regulations must be strictly adhered to in order to preserve the historic value of the building when considering repairs or improvements. The courthouse was designed in the Spanish Revival style of architecture, somewhat resembling the old missions of California. The foundation of the courthouse required 500 barrels of cement, 300 wagon loads of gravel, and 150 loads of sand. It was estimated that 800,000 common red bricks were used during construction. They were made by the San Joaquin Brick Company, which erected a manufacturing plant where suitable clay had been found on the Charles Brusie ranch in Sonora, adjacent to today's Rotary Park. Eighty-five thousand Roman pressed (or buff) bricks were brought to the site for exterior use. A good brick mason could lay 2,500 red bricks a day, but only 300 of the yellow bricks due to the care and skill required to lay the exterior veneer. Mosaic tile was laid in the grand entry, and in the hallway of the second floor. It is the same tile you see today. These were said to have come from Holland, although research casts some doubt on that. The marble wainscoting and steps that you see in the halls of the courthouse was quarried near Columbia. The courthouse was designed to have an elevator (see skylight), but it was never installed. There are 48 steps to reach the third floor. The Seth Thomas clock was installed in June, 1899. The bell weighs 1000 pounds and the weights of the bell weighed 1300 pounds. The remainder of the clock works was proportionately heavy. The clock was started to keep time at 5:00 p.m. on June 22, 1899. The Union Democrat reported that the bell could be heard at a considerable distance. Throughout the years, the accuracy of the clock has been a topic among residents in the downtown area, and remains so today. In the early 1930's, the weights and crank were replaced with electricity. In the evening on Thanksgiving, November 30, 1899, all of the 232 electric lights in the courthouse were turned on at once, and many local residents came to witness the event. The lower floor of the courthouse originally housed the Sheriff's Office, Superintendent of Schools, and the boiler room. The second and third floors of the courthouse originally housed the Offices of the Treasurer, Clerk, Assessor, District Attorney, Judge's chambers, law library, the Superior Courtroom, and the County Supervisors' Chambers. A large room at the southeast corner of the lower level was not designated for any immediate purpose, and to protect it, patent steel roller shutters were installed upon its four windows. When the Tuolumne County High School District was formed in 1902, the first classes were held in that room for four years. In 1906, classes were moved to the newly constructed high school on Shaws Flat Road. The steam boiler and related equipment for the courthouse arrived late in June of 1899 and it was installed on the lower floor, where we now enter the courthouse. The boiler was designed to use solid fuel, and on the average during the cold months it was estimated that it would consume a railcar load of coal and 35 cords of seasoned oak wood, which was cut in three foot lengths. The annual supply of live oak and white oak wood was purchased through competitive bid and delivered by the contractor. In 1901, live oak was furnished at $5.50 per cord, white oak for $4.75 per cord, and pine for $4.45 per cord. The wood was originally stored in the basement until 1908, when the janitor complained that flying bugs from the wood made his life unbearable. He was given permission to store it outside thereafter. Eventually the boiler was converted to burn oil, thus relieving the janitor of some hard work. Since then, the heating system has been modernized, and air conditioning was installed. The boilers were removed, and the nearby archive area was relocated, allowing space for construction of a new courtroom. All of the information contained herein has been condensed from two articles written by County Historian, Carlo M. De Ferrari, in Vol. 39, No. 1, July-Sept., 1999, and Vol. 39, No. 2, Oct.-Dec., 1999 of CHIPSA, the Quarterly of the Tuolumne County Historical Society. For more fascinating facts and stories concerning the development of Tuolumne County throughout the years, please visit the Tuolumne County Museum at 158 Bradford Avenue & Lower Sunset Drive in Sonora, or read the CHISPA, the Quarterly of the Tuolumne County Historical Society.